You are here: Home > Linen Napkins & Napkin Rings > Napkins for Tabletop > Polyester Solids Cloth Napkins > Econoline Polyester Cloth Napkins > Polyester Napkins (Econoline) - 20" x 20"
Polyester Napkins (Econoline) - 20" x 20"
Start off a memorable festive celebration with our stylish Polyester Napkins to wow your party ambience! We provide an exciting collection of Econoline 20" x 20" Polyester Napkins – perfect for special gatherings, ranging from weddings to corporate events. 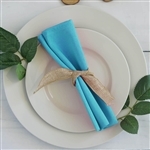 Put these charming Econoline Napkins in the center of your tabletop for an elegant touch. You can explore different color options to meet your fundamental needs in aborning any special event. 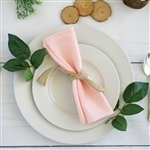 Whether you are planning a fancy bridal shower or a special dinner party, a thoughtful napkin fold can stand out, commonly used as a focal point for any theme-based table settings. 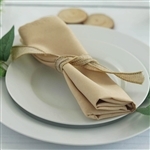 Our bulk-rated Econoline Polyester Napkins are an ideal choice for various types of party hosts, from banquet owners to wedding planners. Treat your guests with the lovely table settings at your special occasion! 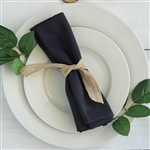 Why buy Linen Napkins & Napkin Rings from RazaTrade?